1) A White tail deer uses it's tail to communicate with other deer. If a deer senses danger it will raise it's tail as well as stomp the ground and snort by blowing air through it's nostrils. 2) The deer's eyes give 310 degrees of vision without moving its head. This means that their blindspot is 50 degrees. 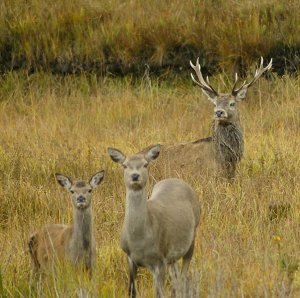 The field of vision makes it difficult for the deer to remain focused on certain objects. 3) Deer are powerful swimmers and can swim up to 13mph. 5) Other predators account for 60,000 deer deaths a year. Coyotes used to be a deer's main predator; but now it's humans. Nevertheless, coyote urine remains a great deer repellent. 6) Once deer establish a territory, they will not leave unless pushed out by humans or other predators. 7) Whitetail deer can sprint between 30-35mph; however they cannot keep this up for long periods of time. 8) Deer are able to clear a 7ft high standing point; and up to 10ft while running. In order to keep gardens protected using Deerbusters deer fences, Deerbusters recommends a fencing height of at least 7.5''. 9) Typically, human hearing is around 20,000 hertz whereas a deer's hearing can reach 30,000 hertz. 10) Scientists estimate that deer's vision is 20/100.